According to customers’ requirements, Leizhan engineer and experts will offer custormized design for paper plant. Leizhan 25t/d high-grade toilet papermaking turn-key project is specially designed by Leizhan engineers for the 25t/d production capacity paper manufacturing turn-key project. The whole toilet manufacturing line featuring stock preparation system and tissue making machine system. 1.Chain conveyor is used to convey raw material into the ZDSD23 D Type Hydrapulper for pulping. 2.The paper pulp will be transported to ZSC3 high density cleaner for cleaning the heavy impurities in paper pulp. 3.Later, ZM450 conical refiner ZDP450 double disc refiner will be used in series for pulping. 4.Finally, the fine paper pulp will enter into headbox for paper making. 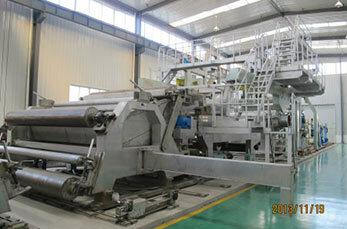 Leizhan high-grade 25t/d toilet paper processing equipment have a width of 2600mm and work speed of 500m/min. It can output 25t toilet paper per day and has basis weight of 13-40g/m2. In comparasion with 10t/d toilet paper production equipment, Leizhan 25t/d toilet paper manufacturing device has a higer work speed and production capacity.